Boston Residents Speak Out About Abu Ghraib, Guantanamo and the Erosion of Civil Liberties | Democracy Now! Yesterday in Boston the United for Justice with Peace Coalition and ACLU held a rally in Copley Square to protest human rights abuses brought on by the so-called war on terror. Throughout the week at the Democratic Convention, speaker after speaker has addressed the delegates on the issue of the invasion of Iraq, weapons of mass destruction and reconstruction. 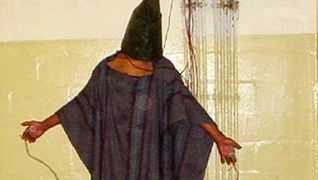 While much of the focus has been on U.S. soldiers there has been little mention of the plight of the Iraqi people and the Abu Ghraib prison abuse scandal. Yesterday in Boston the United for Justice with Peace Coalition and ACLU held a rally in Copley Square to protest human rights abuses brought on by the so-called war on terror. Rally speakers included Congressmember Denis Kucinich. Demonstrators donned orange jump suits and stood behind wire cages. Here are some of what they had to say.